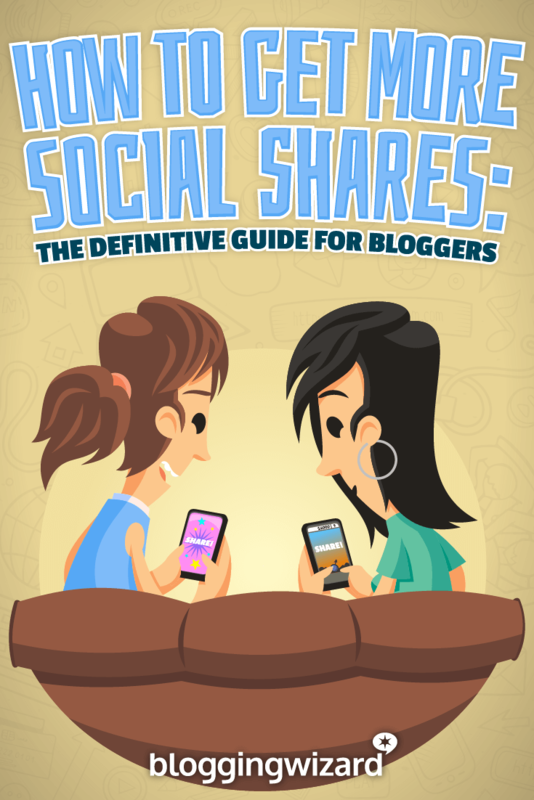 Have you ever wondered how the top bloggers get so many social shares? We’ve all asked the question at some point. And sure, social share counts are a bit of a vanity metric but that’s only part of the story. The benefits are endless, but what can you do right now to significantly increase the number of shares on your content? Below you’ll find some of the most effective tactics, and you’ll learn exactly how to implement them. And while sometimes you won’t need to ask, more people will take action when you do. I particularly like how Jon Morrow asks his newsletter subscribers to share the latest content from SmartBlogger (previously Boost Blog Traffic). What I like about how Jon asks this question is that he gives a reason why you should share; it isn’t just “please share it”. Having a reason to share is important. Don’t make your readers work too hard. Add social sharing buttons and you’ll make it far easier for them to share your content. It’s not enough to just add some social sharing buttons and hope for the best. The more options you give people, the less likely they are to take action. It’s like when you open a menu at a restaurant and you’re faced with so many options that you don’t know what to choose. Which social networks does your audience use most? 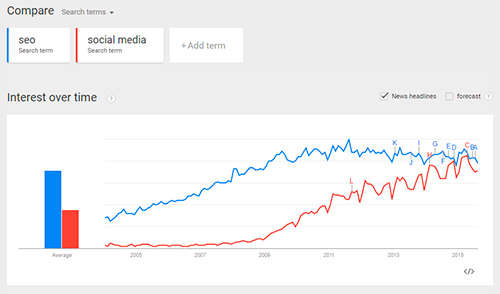 Twitter & Facebook are typically popular but if you have a B2B audience, LinkedIn is worth including. Social Snap is one of my favorite WordPress plugins to display social sharing buttons. It has some interesting features such as the option to upload unique Pinterest images and a click to tweet feature which I’ll talk about more in a moment. For more information, check out my post on social sharing plugins for WordPress. 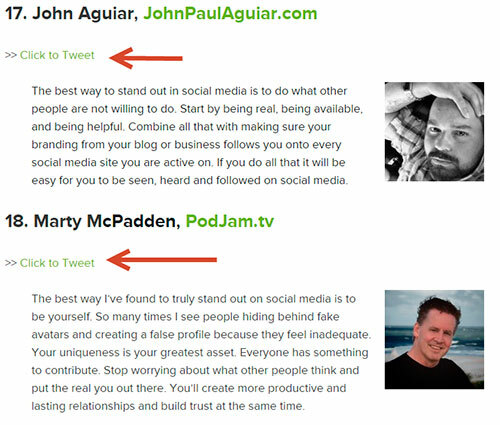 You may have seen these “click to tweet” style boxes already and they’re becoming more popular because they work. A free tool called ClickToTweet was used to create these pre-populated tweets but if you use WordPress, there are some alternatives that make the process even easier. Earlier I mentioned Social Snap, which I use to display social sharing buttons but it also has a handy ClickToTweet function. There are a few other templates you can select and if you know CSS, you can style your own. If you’re looking for a free alternative, you could use a plugin like Better Click To Tweet. We mentioned social proof earlier, but it’s important to discuss how this can impact other parts of your blog and how it can be an issue if handled wrong. The truth about social proof is that it works both ways. If you display a low number of social shares, it will convey that others aren’t sharing your content, and they’ll be less likely to share. If a post hasn’t got many comments, others will be less likely to comment and more likely to if a post has a lot of comments. You’ll overcome this hurdle as your blog grows, but there’s one way to get around it right now. A bunch of social sharing plugins have this feature, but not many. For example, Social Snap has the option to hide total & individual social share counts while revealing the count once it’s above a certain number. A big part of why people share content is the topic itself. On the one hand you’ll have topics that are trending or on the verge of becoming a trending topic – these can generate significant traction initially, but then interest will diminish. You’ll then have topics that people just can’t get enough of – otherwise known as evergreen topics. Whether you focus on one of these or both will depend entirely on how you approach content planning and the needs of your audience. The challenge with identifying trends is that you just don’t know for sure what will trend. You have to pre-empt these trending topics by watching other blogs in your niche along with industry publications. So I’d recommend subscribing to the newsletters of other blogs in your niche along with industry publications. The main reason for this is because large industry publications are watched by other bloggers. And more often than not, these publications will publish an article that starts to trend with the help of other bloggers linking to it. Understanding your audience comes into this too. You can then look out for topics that are a big deal to your audience and try to cover them before anyone else does. Covering a topic before the trend happens is key to making this work and using that trend to grow your audience. It might take only one post going viral to put your blog on the map. The truth is that it can be difficult to monitor trends productively, but Ann Smarty wrote a helpful post that covers how to do this in more depth. This is a tricky one but after you’ve been blogging for a while you’ll start to get a feel for which topics are evergreen, but a good place to start is Google Trends. The truth is that in certain niches, evergreen topics will tend to fluctuate over time, and they also have the potential to become trending topics themselves. Knowing your audience is a key element that will influence the success of your blog. While there are plenty of ways you can get quantitative data about your target audience, the best way to gain the insights you need is to ask your audience what they want to learn and how. Publish the right type of content – do your readers want case studies, tutorials or something else? Cover the topics they’re interested in – this will validate your content planning. Understand the language that resonates with them – when you use the language that your audience responds to, you’ll find it easier to connect with them. Draft out some potential questions for your readers, then use a survey tool such as Typeform. The free version will do the job. Along a similar vein to adding share buttons to your posts, you can also make both images and text shareable. It’s easy to setup, fortunately. Like other Sumo apps, it can be installed on WordPress self-hosted blogs or any website that supports HTML, and it’s free. There will likely be a number of your visitors that have the Pinterest browser extension that will overlay Pinterest buttons. But by using a tool to do this, you’ll be able to ensure that everyone sees these buttons. The truth is that this may not have a massive impact on your shares, but it will likely work better if your niche is more visually focused. 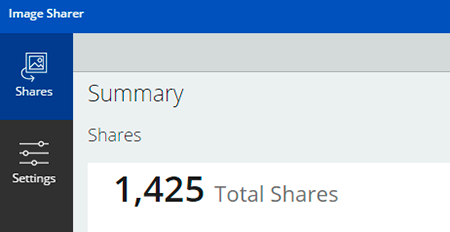 On Blogging Wizard, we’ve had a decent amount of shares thanks to this. If you want to test out shareable text, you can use Sumo’s Highlighter app to give your readers the option to share text after they highlight it. The more scripts/plugins you add to your website, the slower it will load. Use online tools to benchmark your website’s page load times, and make a judgement call as to whether the performance hit is worth it. There are influencers in your niche who have the clout to drive a lot of eyeballs to your blog. You could start by mentioning influencers in your content when relevant, and letting them know about it. But you’ll get better results by involving influencers directly in the content creation process. The first step is to identify which influencers to get in touch with. You could use a tool for this but if you’ve been blogging for a while you will likely have an idea of who the key players are already. You could ask them for a quote or do a group interview. I’ve had some great results doing these in the past. I asked some of the biggest names in the social media space to share their 3 top tools for managing social. One important lesson: If you change from http:// to http://www., Pinterest and Twitter will not remember share counts. The great thing is that all it takes to get started here is a list of people to contact and a question to ask – be sure to follow the best practices for email outreach. Creating content like this is time-consuming, but it’s well worthwhile! Content repurposing can be incredibly effective. People prefer to consume content in different ways. Some prefer written blog posts while others may prefer videos or podcasts. A great example of content repurposing in action is this infographic I published on TweakYourBiz.com. I’ve shared this example before but it highlights just how well this tactic can work. It was based on a group interview published here on Blogging Wizard; I teamed up with TweakYourBiz to have it converted into an infographic – this made the information far easier to digest. The repurposed version alone had 2,000 shares and has been seen by over 30,000 people. What worked well here was that we repurposed a group interview where influencers were directly involved into a different format and leveraged the audience of another publication. You could try this for yourself on any blog post you’ve written. Create your own infographic in a tool like Canva or hire a designer on PeoplePerHour, then pitch the idea to a blog in your niche which has a large audience. You’ll need to write some unique content for the infographic and spend a decent amount of time promoting the published infographic, but the results will be worthwhile. It may sound obvious, but it’s surprising how often this step is missed. When you’re an established blogger with a huge email list, just sending a single email is enough to drive a seriously large amount of traffic to each blog post you publish. But what if you aren’t an established blogger (yet)? It means you’ve got to put some serious leg work into promoting your content and getting the word out about your blog. There are plenty of ways to promote each new blog post and drive traffic to your blog. Guest blog on popular sites to drive awareness. Build an engaged social following on sites like Twitter. Share your content multiple times on social networks. Optimize the time you share on social media to ensure your followers will see your updates. Optimize every post you publish for search engines but don’t compromise quality – your readers come first and search engines know that. Identify where your audience hangs out online and plan a strategy to put your content in front of them without shameless link drops – think online communities like Facebook groups and niche forums. Give influencers and other bloggers a heads up when you’ve mentioned them – let them know why you’ve mentioned them but don’t push them to share. You’ve put a lot of time into crafting your content and making it as good as it can be. If your content is going to see the light of day, you need to put the time into promoting it. 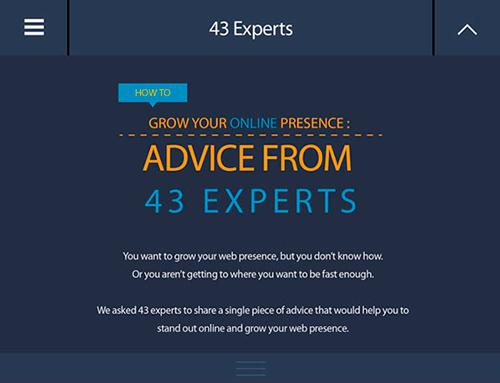 As your blog grows so will your email list, and you’ll get more traction on every post you publish. There are plenty of tactics you can use to encourage your readers to share your content. Results won’t always be instant, but blogging, in general, requires a long-term approach. Soon enough, you’ll start to see more shares and all the good stuff that comes with it such as more traffic and substantial audience growth. The next step is ensuring they stick around, which is where building an email list comes in.